Shah pointed out that Naidu joined NDA in 1999 when there was Vajpayee wave but left the alliance when it lost power in 2004. 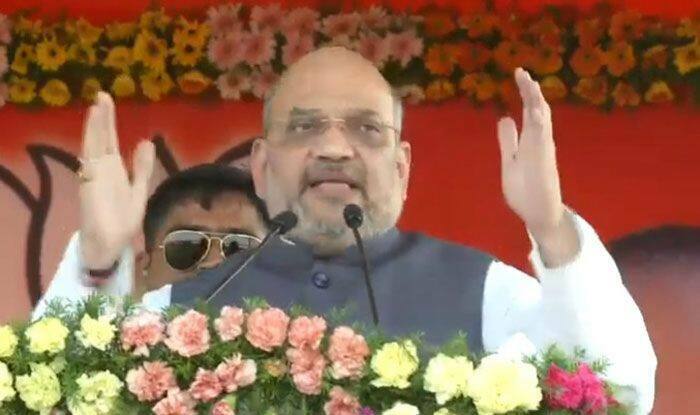 Bharatiya Janata Party (BJP) president Amit Shah on Thursday dubbed Andhra Pradesh Chief Minister N Chandrababu Naidu as the biggest opportunist in the entire country, saying he changes colours whenever it suits him. Addressing a party rally at Narsaraopet in Guntur district, he said the Telugu Desam Party (TDP) joined hands with the BJP in 2014 as there was Modi wave in the country and came to power in the state. The BJP chief alleged that last year, Naidu pulled out of the BJP-led National Democratic Alliance (NDA) as he sensed that there was an anti-incumbency wave in the state. He said Naidu tried to mislead the people by making baseless allegations against the NDA. The BJP leader alleged that Naidu’s political career is full of instances when he displayed opportunism. He recalled that Naidu had quit the Congress party in 1983 and joined the TDP founded by his father-in-law NT Rama Rao but later backstabbed him to grab the power. Shah also pointed out that Naidu joined NDA in 1999 when there was Vajpayee wave but left the alliance when it lost power in 2004. He said the TDP chief joined hands with the Congress in Telangana Assembly elections but as the alliance faced a crushing defeat, he dumped the Congress and refused to have an alliance with it in Andhra Pradesh. Shah alleged that Naidu indulged in corruption in the construction of Polavaram project and development of new state capital Amaravati. He claimed that Naidu was not sincere to complete these projects. He said both TDP and YSR Congress Party were family parties and involved in corruption.